Learning how to trap raccoons that are invading your garbage cans or trash every night is actually pretty easy. Here's the good news.....you don't need aggressive kill traps or foothold traps to protect your garbage cans. A simple live trap purchased from your local home improvement store is all you need! Raccoons are very curious and somewhat brave animals. Since they're always looking for an easy meal, a trash can sitting at the end of the road or outside your house is often too tempting to resist. Once they've found an easy food source a raccoon will be back night after night creating a huge mess until you either get rid of the raccoon with a live trap, or you find a way to deter them from the garbage. Fortunately, raccoons are really easy to catch in a live trap. 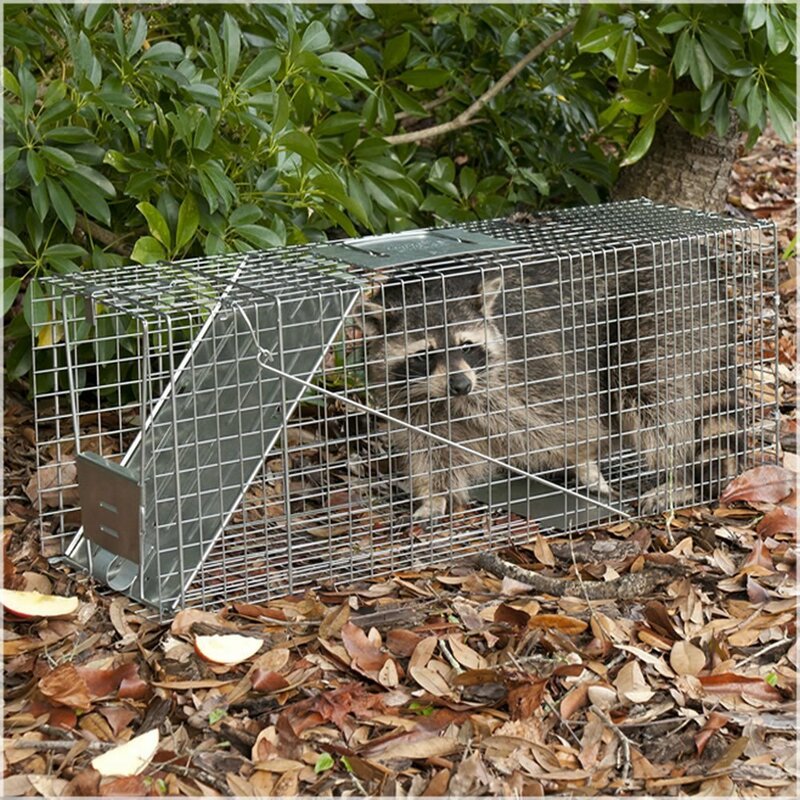 Since they're already looking for an easy meal, a properly baited live trap will usually catch a raccoon on the first night. If you're not interested in setting a trap we'll also explain several other ways to deter raccoons from your garbage can so you're not cleaning up a mess of garbage in your lawn every morning. If you have a problem with raccoons tipping over your trash can or ripping apart your garbage bags, a live trap is one of the quickest and easiest ways take care of the problem. Raccoons are usually nocturnal animals that feed at dusk or just after dark. Chances are you will never see them inside your garbage and you only find the mess they leave behind. To begin you'll need a live trap that's big enough to trap the raccoon. Large trap manufactures like Havahart make live traps specifically designed to trap raccoons. The Havahart 1079 live animal cage trap has always been one of my favorites and seems to outperform live traps made by other manufactures. I've had mine for almost 15 years and it still functions perfectly. Plus, it has smaller diameter mesh on the rear of the trap which prevents the raccoons from reaching through the trap and stealing your bait. Start by placing the trap next to your garbage on a flat surface. You'll want to make sure the trap doesn't rock back and forth when the raccoon walks inside. You can also place a few sticks or branches over the trap to help camouflage it, but it's usually not necessary. Once the trap is in place bait it with fish (tuna fish, sardines or mackerel), dry cat food, jelly or if you're worried about catching a cat or other non targeted species you can use a whole egg or use a ball of tin foil for bait. The curious raccoon won't be able to resist the shinny tin foil but many other animals won't enter the trap for it. Once the trap is baited, set the pan trigger and you're done. Allow the trap to set out undisturbed for the night and hopefully you'll have your nuisance raccoon the next morning. Remember, raccoons typically travel in groups so if you catch a raccoon the first night, you should reset your trap to catch any additional raccoons. If you don't want to learn how to trap raccoons and you would rather use a deterrent or prevention method instead, there are several options you can try. Since the raccoons are targeting your garbage, the easiest prevention technique is to move your garbage inside a closed structure like a garage or barn until it's time to set the garbage outside for collection. If placing the garbage inside is not a possibility, try securing the lid of the garbage can with bungee cords or rope. Other options are to purchase raccoon proof garbage cans that have a lid locking mechanism which securely holds the lid in place, preventing the raccoon from accessing the trash inside. Or you can place a large brick or rock on top of the lid to hold it in place, however, I don't prefer this method because if the raccoon is able to tip the garbage can over the brick or rock will just fall off and the lid will pop open. In addition to the steps above, you can also spray ammonia inside and around the exterior of the garbage can. Raccoons find the smell of ammonia very offensive which will help deter them. 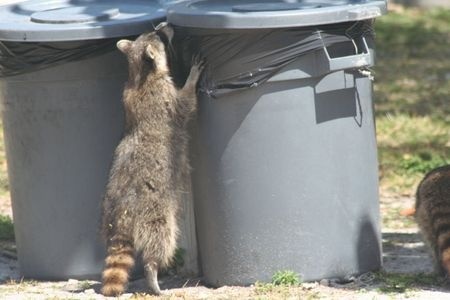 Whether you decide to use a live trap to take care of your nuisance raccoon problem, or you take extra steps to protect your garbage can, keeping a raccoon out of your trash does not have to be difficult. With just a little bit of effort and a few simple supplies you can get rid of a nuisance raccoon yourself without paying an expensive professional.